This is our last day in Tokyo (and Japan! ), Zayd has already left for work and my day will basically consist of jumping out of bed, spending 35 minutes on the treadmill and walking around Tokyo to eat all the foods I haven’t tried yet which include gigantic fluffy pancakes, hokaido soft serve, takoyaki and okonomiyaki. I’ll then be practicing even more cardio while shopping around Omotesando, sounds like a good day? I cannot wait! I made this chorba a few weeks ago just after storm Ophelia left Europe and temperatures started to seriously go down in London. 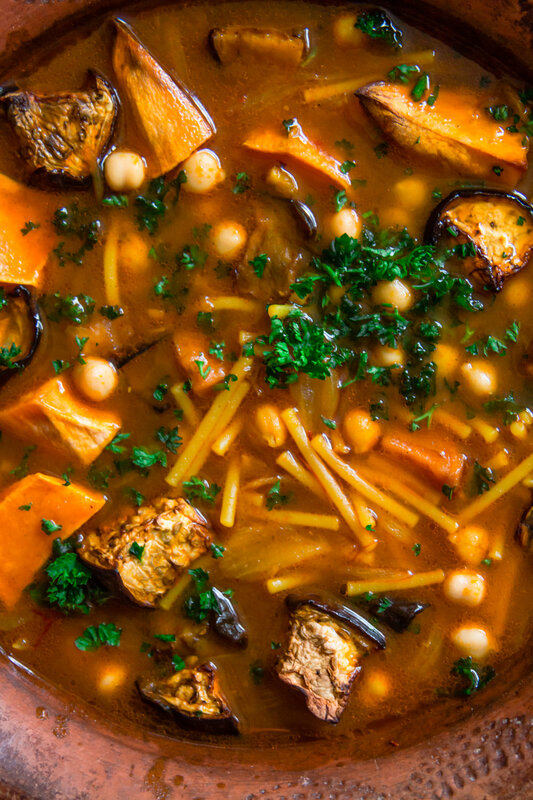 A chorba essentially means “soup” in Moroccan Arabic and usually refers to a clear soup made with meat or poultry and pulses and/or grains. At home my mom usually makes chorba with chicken wings and rice during Ramandan but she also likes to sometimes swap the chicken for root vegetables such as sweet potatoes or butternut squash. 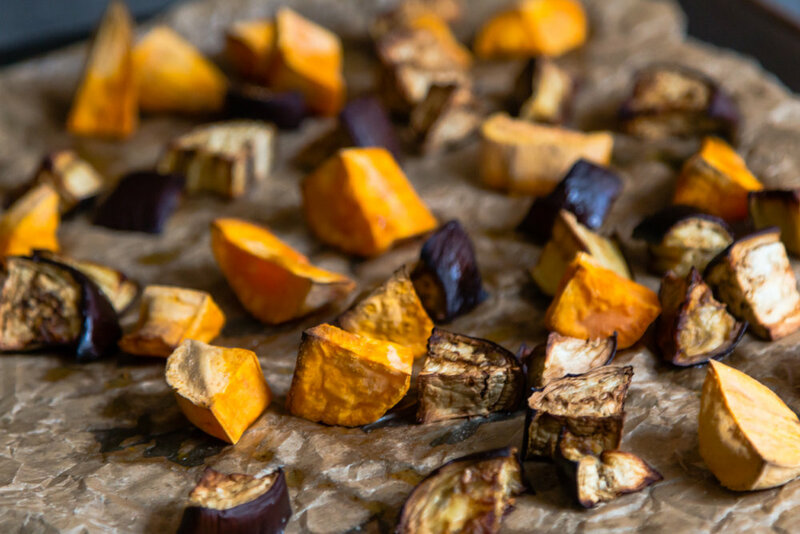 This recipe is a variation of her vegan chorba with roasted aubergine, sweet potatoes and plenty of saffron. It’s so simple, earthy and comforting I always go for a second bowl and the great thing about it is that I never feel guilty! 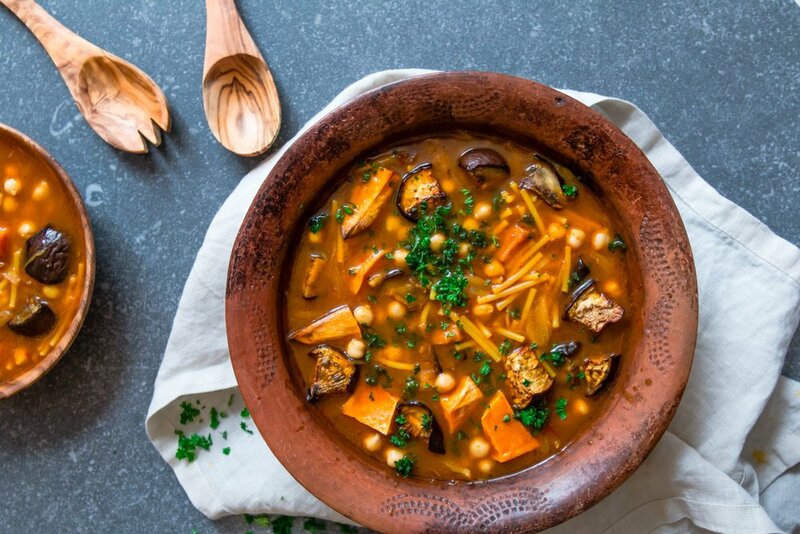 It really is the perfect autumnal-pre winter recipe we all need at the moment! 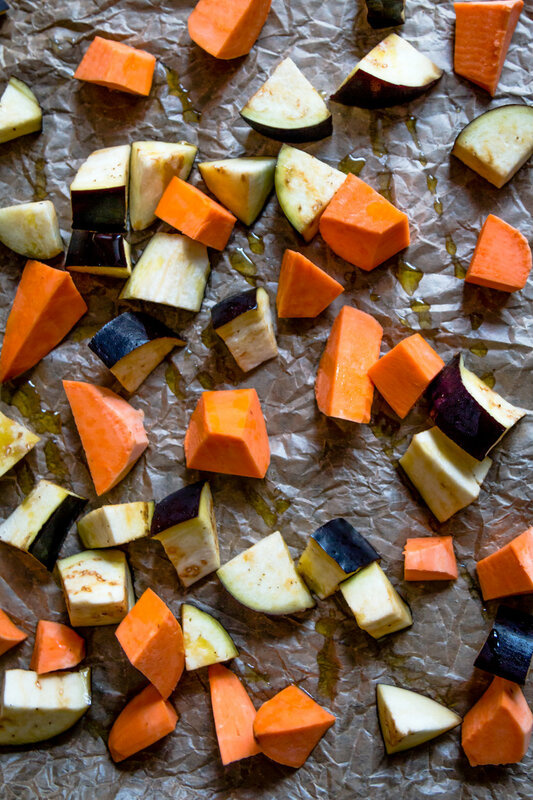 • Preheat the oven to 200 C. Place the aubergine and the sweet potato chunks in a large roasting tray, drizzle with a bit of olive oil and sprinkle with a bit of salt. Transfer in the oven and bake until tender and golden, about 25 to 30 minutes. Set aside until ready to use. • Meanwhile, in a large casserole warm the olive oil over medium-high heat and add the onions, tomatoes, tomato paste, turmeric, saffron, salt and pepper. Leave for about 10 minutes to lightly sweat the onions. Stir occasionally. •Pour the vegetable stock and 1 liter of water in the casserole and bring to a boil. Reduce the heat to medium-low, cover with a lid and leave to simmer gently for 40 minutes. • Transfer the chickpeas in the casserole and increase the heat to medium-high and bring to a boil. Add the broken spaghetti as well as the roasted aubergine and sweet potato chunks, reduce to the heat to medium-low and leave to simmer until the spaghetti pieces are fully cooked, adjust the cooking time according to the manufacturer instructions. • Taste and adjust the seasoning with salt if desired. Serve immediately with more parsley.